CEA focuses on determining the cost of ownership (CoO) of Silicon Heterojunction IBC solar cells and modules using the process flow being developed by NextBase. The latest cost calculations show that the NextBase IBC SHJ solar modules are cost competitive with standard SHJ solar modules. 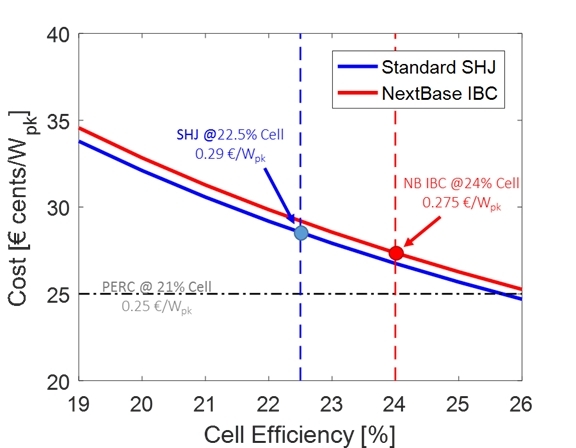 The added complexity of the NextBase IBC technology increases the complexity when compared to standard SHJ solar cells which adds cost due to added machinery and staffing. However, this extra cost is overshadowed by the increased efficiency and the reduction of material usage since both electrical contacts are processed on the rear side of the solar cell. These figures are based on a relatively modest plant size of 500MW being produced in Europe showing that the NextBase IBC technology should be considered when trying to produce SHJ based technologies in Europe. As can be seen with the following figure, the CoO of the NextBase IBC technology is currently estimated at 0.274 € per Watt Peak which is competitive with the projected industry leading PERC technology which is estimated at 0.25 € per Watt peak. Environmental impact is also crucial for the NextBase project. Therefore, CEA INES has been simulating the environmental impact through life-cycle analyses (LCA). 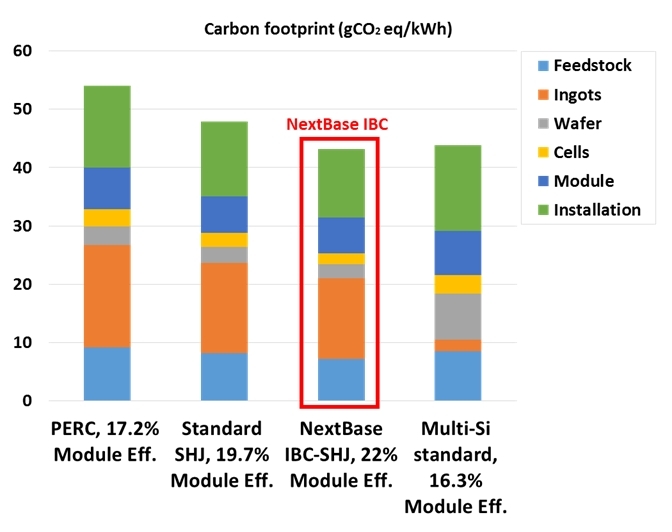 The analysis shows that NextBase IBC cells produce less carbon per kWh than most other technologies including the current market leader (multicrystalline silicon). The main contributors to this favorable carbon footprint are the increased efficiency and material composition since there is some materials are used less when both contacts are deposited at the rear of the solar cell. NextBase in the spotlight at the European Photovoltaic solar energy conference! Jülich organizes workshop in silicon heterojunction solar cells! This project has received funding from the European Union’s Horizon2020 Programme for research, technological development and demonstration under Grant Agreement no. 727523.